There are actually some electric plugs on some light poles in the parking lot but didn't try if work or not. Never saw any security and no one bothered us where we parked (took picture). Fuel and grocery (Meijer) close by -- good phone reception -- good antenna tv -- open for solar and satellite. No 'specials' for new players -- over 50 discounts on some breakfast -- Tables (incl. craps) and Slots. We stayed in a 36' class A over memorial day weekend and was our first time there. 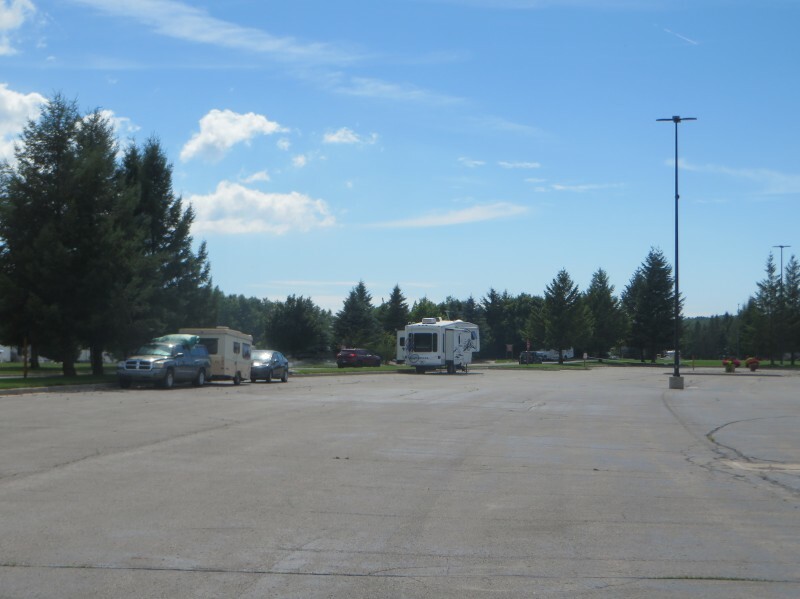 The campground is better than most casino RV parks and has plenty of concrete, level, pull thru sites. I didn't rate the campground a 5 because of 2 things: I wish there were more sites with sewer hook ups, and there are no fire rings but otherwise nice level sites, even though they are a smidgen close to each other. The club house is within walking distance with showers and laundry facilities. The Casino is easily within walking distance but a golf-cart shuttle will pick you up at your site or bring you to it. The casino itself is large by Michigan standards and has a beautiful atrium with a waterfall and river inside. I'm not a huge gambler but the games seemed all new and the main area clean. The buffet was wonderful. On Friday there is a seafood buffet which had grilled lobster, crab, oysters, fried clams, shrimp, etc. It was really good I thought. Breakfast is also a great buffet that we liked and was worth it. We have been going here to this resort for years (12). It was our favorite place to camp and gamble and relax. It is a 5 and 1/2 hour trip as we live in NW Indiana. But we love to take the trip every year here. Camping was always affordable and meals were to. Recently over the last couple years we heard a new GM took over. MY parents also go RV camping here every year as they are retired. Well I call to reserve a campsite and sure enough their rates almost doubled in price!, we go anyway and when I checked in told them I wasnt happy about camping prices and lady told me everyone was complaining about it. We always go for a 3 night stay. We had fun and also noticed food prices went up a lot to. Talked to a fellow RV guy camped next to me and he is from Michigan said a new GM took over and raised prices to new highs guessed to pay for new renovations there. Motel prices soared to. After I got home a couple of weeks later I decided to call them and ask. An asst. Director called me back and said they called around and based their new high rates as comparable to campgrounds in the area. I said really are you kidding me. Other campgrounds dont have a cash cow casino on their property generating revenue. They need money to operate. We since cut our visits here and it is really sad all beacuse of greed! Camping at any casino should be affodable because they know they will get your money the moment you walk in the casino. They also had a punch card when you stay 5 nights get 1 night free. That is gone to. This was our favorite trip to go on every year. We looked forward to it so much every summer. We would also shop and golf nearby. It is a nice rv park. It is really sad they price gouge now. Their are a lot of renovations going on and guess the guy camped next to me was right. We have to pay for that! Since then we go to a place in Illinois to camp and gamble that is closer but really miss going to Little River! To double the prices is outrageous! My parents still go every year and they talk to a lot of campers there and they said same thing that a lot of campers complaining about spike in RV site prices. Guess it is their right to do what they want but is business that good that they can afford to lose patrons? We are here right now and it is wonderful. Friendly staff with on call shuttle to Casino that runs until 1:30 a.m. The campground is very nice with full service and economy service lots. Office has free coffee all day and exceptionally clean showers and bathrooms. Players Club card gives you discount to breakfast buffet ($5.25) per person and they have a Veterans special every Tuesday. Love it and we'll be back often!